I had been wanting to experiment with various mediums including paper type and markers (I found out Sharpie paint markers are not as brilliant as I'd hoped). And, I was itching to do an illustration for myself, to market my skills and have differentiating photos on social media. But then I thought about how flat my photos of the recordings can be sometimes. I wanted fresh eyes on how to approach photographing the work. A-ha! I know where to find emerging photographers! I introduced the following challenge to the students over two days: to create a cohesive marketing photo campaign of 3-5 images of the following graphic recording using any method of lighting and including any props or people they chose. The only other criteria being judged was teamwork. The latter proved to be more challenging for larger classes, understandably, but I was utterly impressed by the initiative and knowledge of many students in each and every class. The winning class receives full credit for the photos on social media, mention in an upcoming lifestyle blog I'm being interviewed for and choice of a pizza or donut party, which is, of course, where I heard the "yeaaaahhh"s and excitement. I'm psyched to announce the winning class is 3rd hour (B)!!! They not only brainstormed before jumping into the work, they collectively came up with the most variety of images and made sure everyone was involved in some aspect of the process. Congratulations, Ana, Abbie, Britney, Britthani, Gabe, Jonatan, Lynda, Marcus, Owen, and Rochelle! 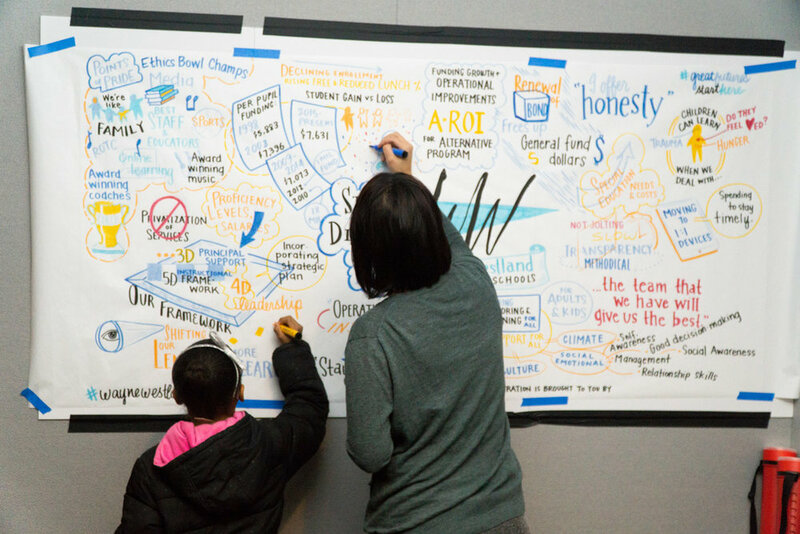 I've long worked with corporate entities to offer graphic recording that could be revisited for marketing and internal use but now educational organizations are finding ways to fund what I do too. I recently had the privilege of working with Wayne-Westland Community Schools to capture their State of the District. Their Superintendent, Dr. Shelley Holt, spoke passionately and candidly about the struggles the district faces. And she is one of the most personable people I've ever met! (You'll see what I mean below.) I was really touched by her candor and have great faith in the plans she offered to break through some of the barriers the district faces. I was also thoroughly impressed with the presentation of the band and color guard, certainly indicative of the talent of the students and staff. Because Wayne-Westland Community Schools has a script logo, I got to take a hand at doing some ink drawing. This method was used on the main graphic recording, which I did earlier in the day. I didn't want drippy ink on the wall! I finally got around to taking some photos of the In the Neighborhood drawings, part of Ann Arbor Area Community Foundation and Eastern Michigan University's Engage @ EMU Office's effort to define what arts and culture looks like in Washtenaw County. This is an example of an illustration done in graphic recording style that focuses on lots of text content. It was a blast to host a gathering with artists and students and then gather and distill the content of all the gatherings. Last month I learned about an incredible effort by Kelly Mickel, principal of Erickson Elementary School and other community partners including Washtenaw County Sheriffs Office, Washtenaw County Juvenile Detention Center, Cultivate Coffee and Tap House, Girls Scouts, and Mosaic Church. The Village Project seeks to break the school-to-prison pipeline in the Ypsilanti district. Many of our students have had exposure with incarcerated family members or visited family or friends in detention centers, returning with the idea that they didn't seem so bad. To compare their current life situation and find detention centers a better alternative sounded heartbreaking to me but it's a reality of perception our youth face. Efforts are being made right now to lift up students through a 3-pronged effort of mentorship, skills training and life experience. A "signing day" will match up "coaches" with students with special attention given to matching up adults and student based on interests and personalities. There are still lots of details to work out but through the leadership and resources each of the community members bring, I believe this will be a successful program to change the sentiment and trajectory of many of our most at-risk youth. More to come!